Read the event review of our latest adventure with STC at George Mason University. Many thanks to Greta Boller for the kind words. Event Review: Building Your Professional Identity in Technical Communication Workshop at GMU | WDCB Events & News. Connect with me in a variety of formats online. I’d love to hear from you. I’d appreciate your support in the election. But more importantly, I want you to say “Yes” to STC. We need you. 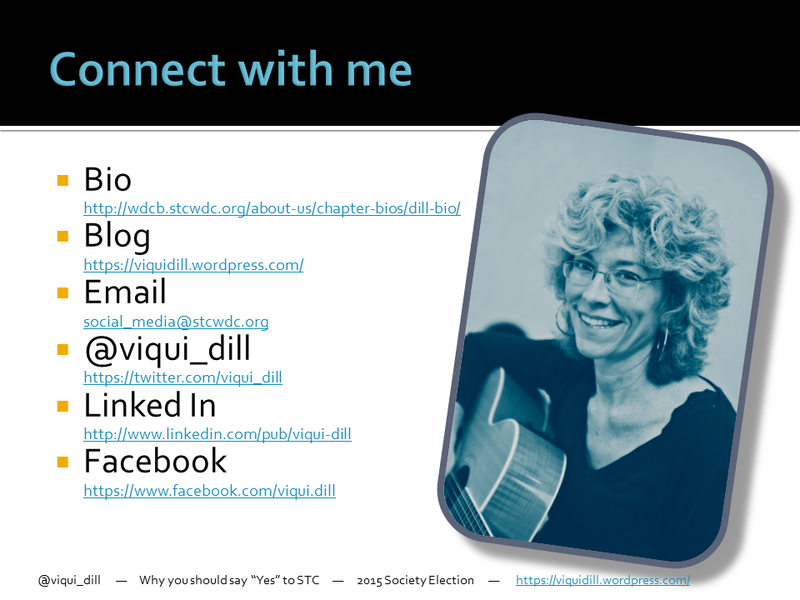 Here are slides from my Lightning talk at the STC Summit 2014. More serious content wrapped up in silliness and set to music. I presented the material to the tune of “The Devil Went Down To Georgia” and attendees sang along. I’m starting to get excited about 2015 and pulling together my ideas for a new presentation about training. Stay tuned. 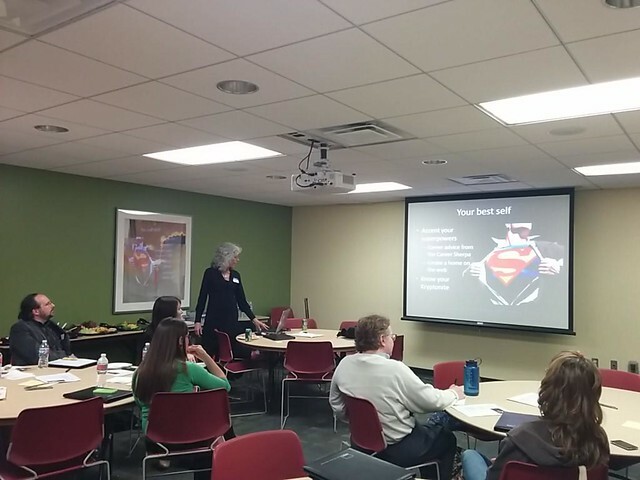 Slides from the STC New England InterChangeNE Conference in March 2014. Serious content wrapped up in a fun delivery. Read about the conference in my earlier blog posts about day one, day two, day three, and day four. 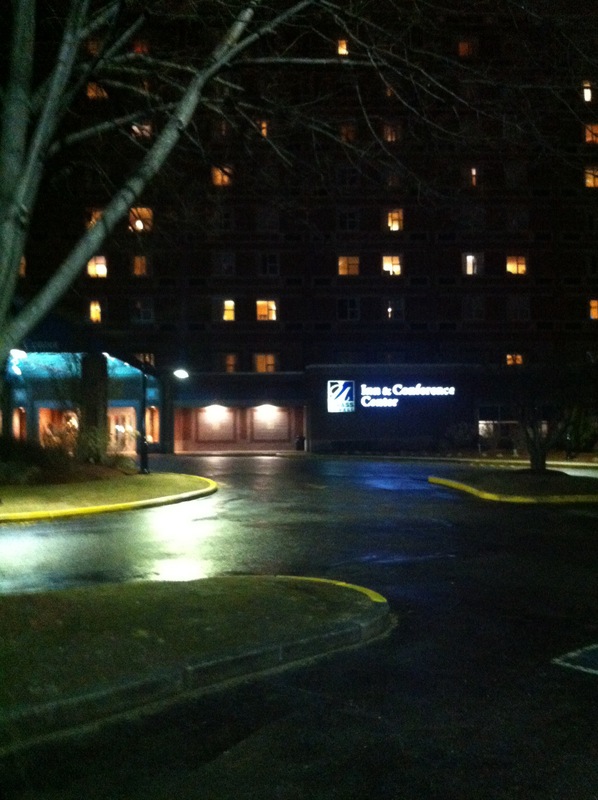 On March 29th and 30th, I attended InterChange 2014, STC New England’s annual conference at the UMass Lowell conference center in Lowell, Massachusetts. 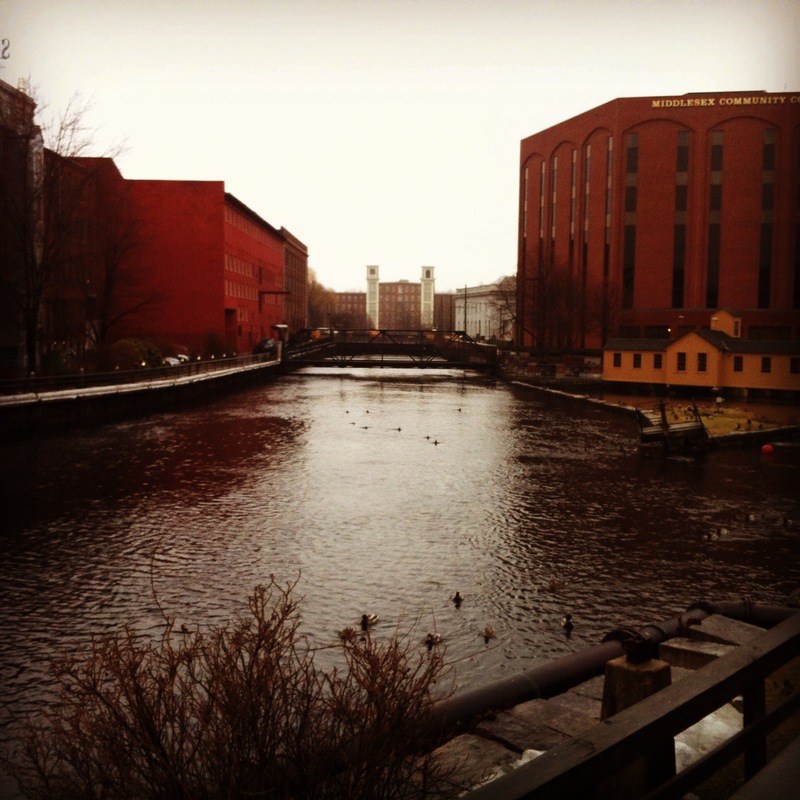 After the conference was over, we hung around town to take in some of the sights and history. This post is about Day Four. You might also enjoy reading Day One, Day Two, and Day Three. You may recall from Cindy Currie-Clifford’s keynote speech on Day One that it’s an InterChangeNE tradition that it snows during the conference. So it didn’t exactly snow, it sleeted and iced instead. If you know anything about me, you know I’m a real wussy about driving in snow or ice. Rick Lippincott to the rescue! Über conference planner and veteran snow driver, Rick Lippincott volunteered to drive us around in his rugged jeep. I volunteered to sit in the back and pretend it’s just rainy. Jimmy Dill volunteered to ride shotgun and watch videos on his iPhone. While the rest of us technical communicators are writing “Click OK to continue”, Rick is writing about this bad boy. 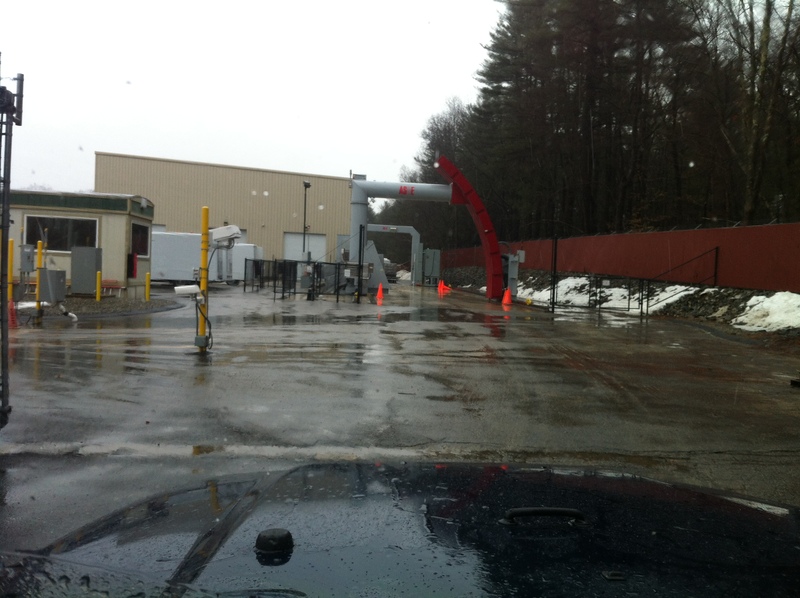 We are at AS&E, American Science & Engineering, in Billerica. The security gate is open and we can look in. I hand my iPhone up to the front seat for a quick picture. In Concord, we visit the Concord Museum, Louisa May Alcott’s orchard house, Author’s Ridge in the Sleepy Hollow cemetary, and the famous Old North Bridge. 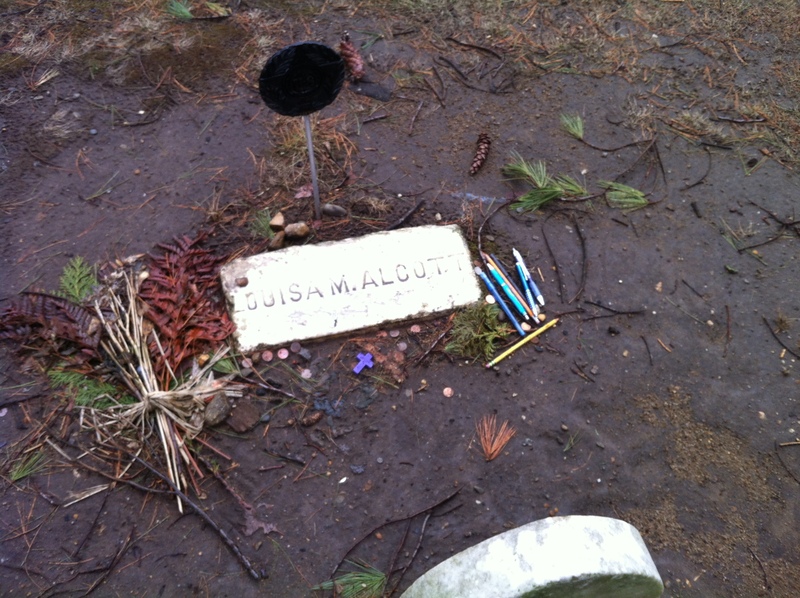 At Author’s Ridge, I was touched by the little tokens left by visitors to Louisa May Alcott’s grave. Many of the visitors left pens as a tribute to her writing. She inspired many so many of us, especially young women. At the Old North Bridge, we are accompanied by a busload of middle school students and their chaperons. 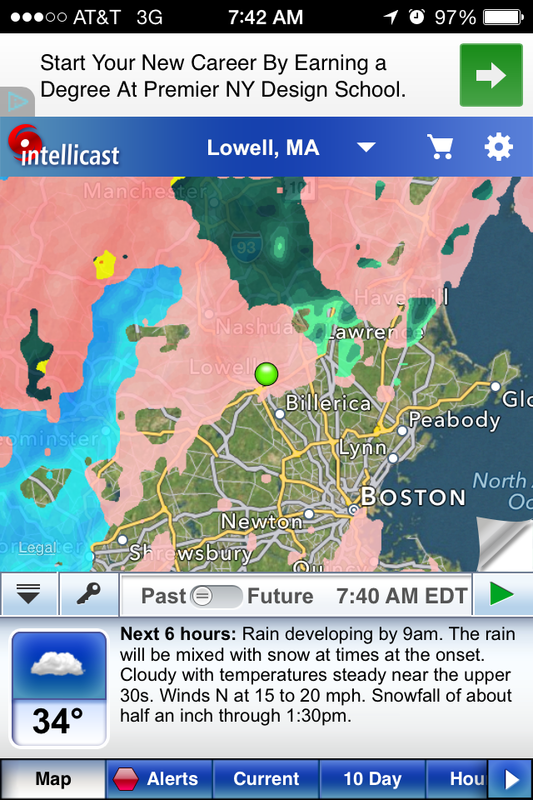 It was fun to hear their happy chatter as we trudged toward the Minuteman statue in the cold rain. By the time we saw the sights in Concord, it was time for lunch and our thoughts returned to sushi. On a cold damp day, nothing warms you up inside like a nice carafe of sake. Yep, we had sushi at Etsogo Sushi and Asian Restaurant. Again. Yum. I made a little Instagram collage of our day. 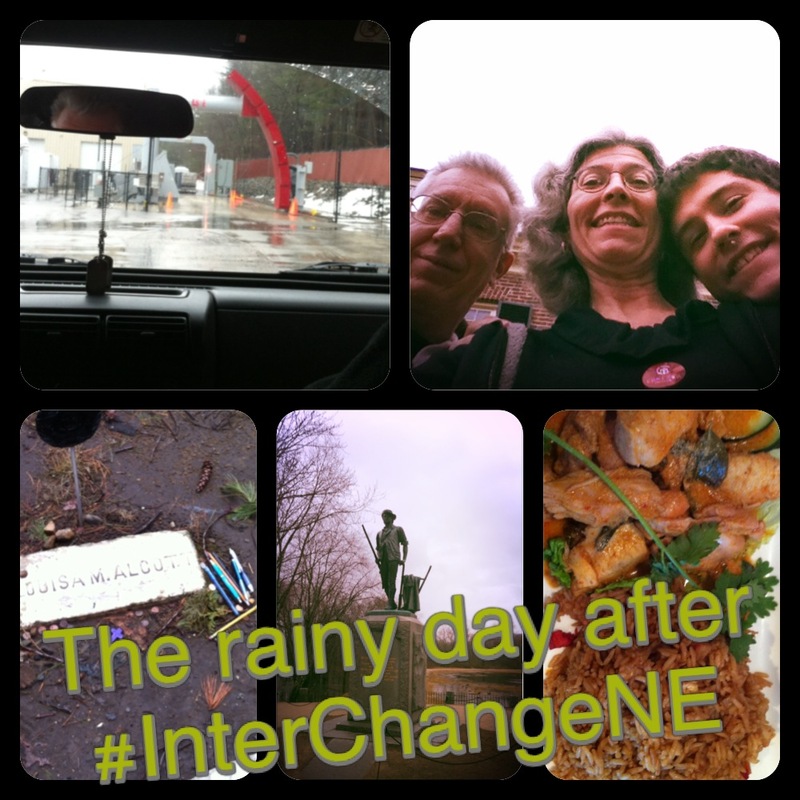 Instagram collage of the rainy day after InterChangeNE: Rick’s workplace, selfie of us, Alcott’s grave, the minuteman, and more food! So as we prepare to head back to Winchester Virginia after the InterChangeNE conference, I am super pumped up about all things #TechComm and looking forward to next year. Many thanks to the New England STC chapter and all the folks who put in so many hours to make this local conference a success and a blessing. Don’t forget to visit Rick Lippincott’s photostream of the event. On March 29th and 30th, I attended InterChange 2014, STC New England’s annual conference at the UMass Lowell conference center in Lowell, Massachusetts. It’s my first time presenting at a local chapter conference and I’m so excited about the opportunity. My goal for the day is to break as few things as possible and impersonate a grownup. This post is about Day Three. You might also enjoy reading Day One and Day Two. I’m so excited about the day, I even found the iron in the closet of my room at the Conference Center. I ironed my shirt and drank all the self-serve coffee in the room. Then I went out in the lobby for more coffee. Thank you to UMass for all this awesome coffee. I found makeup in my purse and put some on my face, mostly hitting the target, but very out of practice. The wonderful UMass conference center staff were in the room bright and early and let me use the remote control for the laptop. It has a laser pointer on top, which I thought was just too cool. The talk begins and I’m having fun. Social media is one of my favorite topics and the story we’re telling today has a happy ending as I used some fun graphics and memes in Facebook to spread the word about an event for my church. We start out with a serious discussion about EdgeRank, the algorithm Facebook uses to figure out what it will show and what it will hide in your NewsFeed. We start out all brainy, defining parameters and using big math concepts long dormant to discuss how to use the process to our advantage. Then the fun begins and we look at the silly graphics and memes. You can check them out on Facebook here and here if you want to see the originals. While you’re there, you can like them (please) and maybe leave a comment (please please please). Lots of nice folks showed up for the presentation. These folks are so smart and asked great questions. Some of them told great stories about their own social media journey. 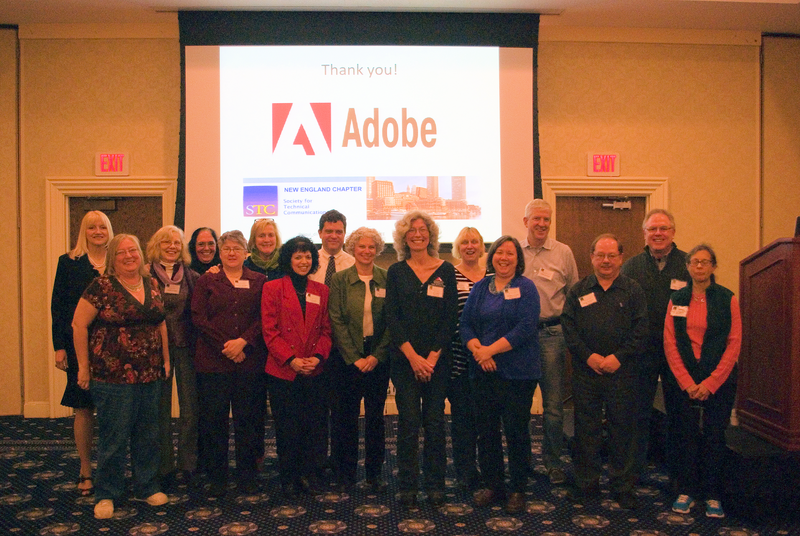 When the presentation was just about over, we gathered for a group photo as a way of saying thanks to Adobe for their generous sponsorship of the conference. 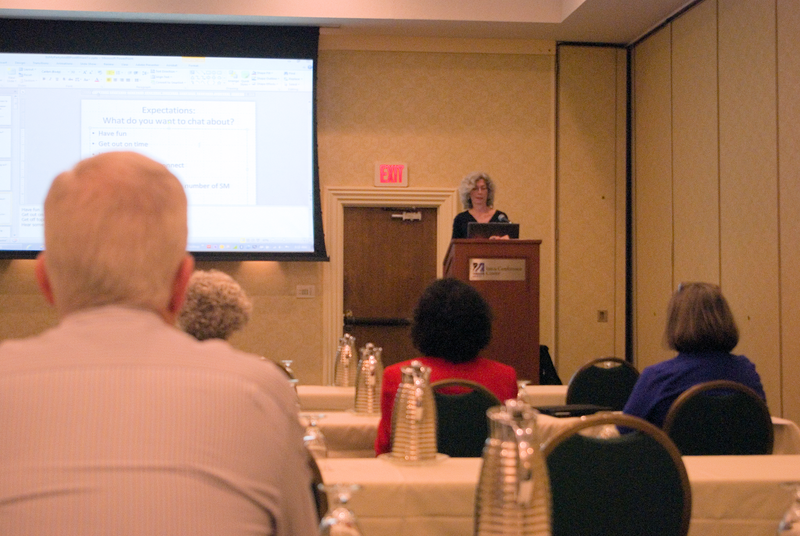 Many thanks to Rick Lippincott for all the photos of the conference. Be sure to check out his flickr photostream. And I didn’t break anything. Goal accomplished! I posted the slides online, so have a look for yourself. Steve Jong brought us a brilliant analysis of how different generations think, act, communicate, and feel. Steve’s slides are on slideshare. Check them out. Char James-Tanny is one of my tech comm heros. I am so star struck when I’m around her. She spoke about accessibility, specifically relating to Word, and also in general everyday life. She is knowledgeable and generous with her knowledge. She is well respected in our field. She has purple hair. I ask for a picture of us together. 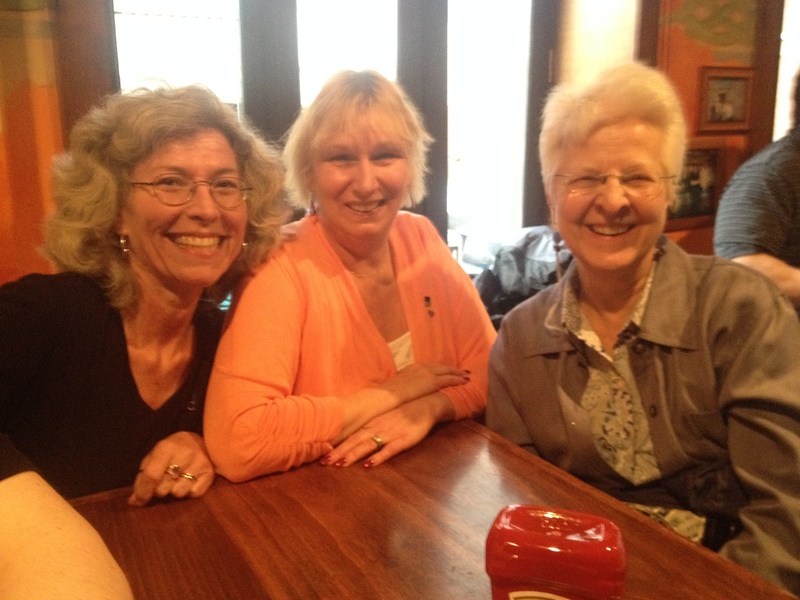 We are pictured here with Brenda Huettner and Cindy Currie-Clifford, two of my other tech comm heros. And the photo is taken by Ed Marshall, another superstar and an amazing bass player. At the end of the conference, we all gathered for a closing speech by Rick Lippincott about “Looking Backward” and gave a fun history of technical communication throughout history. Rick, if you’re reading this, please share your slides. I want to steal some of your ideas. Then STC New England chapter president Emily Alfson and VP Nancy Allison draw tickets for the raffle. I didn’t win but it was fun to be a part of seeing others win. We did not start out to eat sushi again after the conference. We tried to go to several other places but none of them were open on a Sunday afternoon. I was secretly hoping that we could have sushi. The conference center did not start serving dinner until 4:30 and we were hungry at 3:30. I was secretly hoping that we could have sushi. The Irish Pub was closed. I was secretly hoping that we could have sushi. Another pub down the street was also closed. Dunkin Donuts was open. I was secretly hoping that we could have sushi. 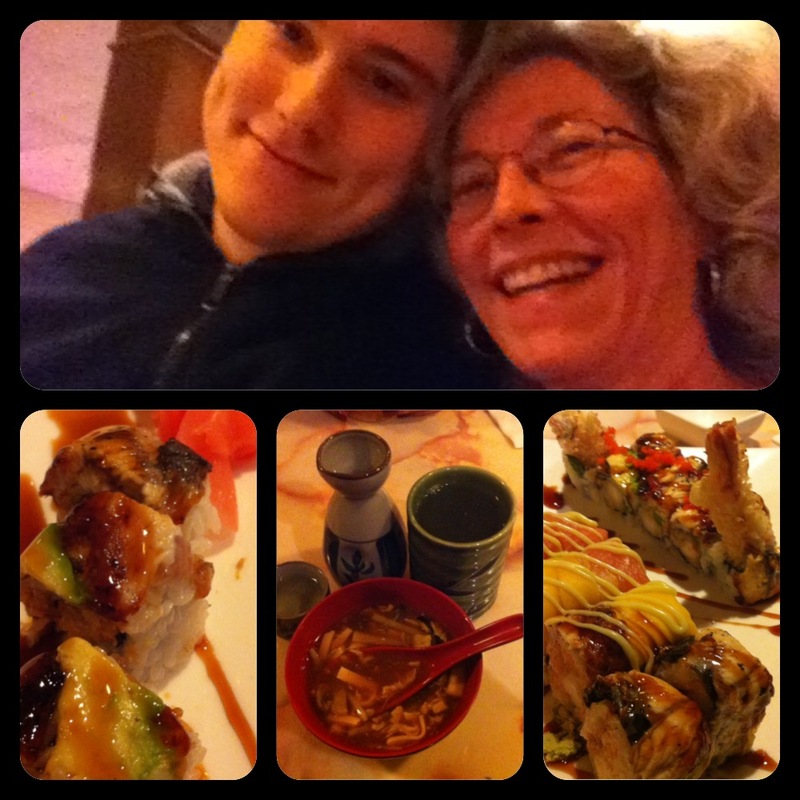 We had dinner at Etsogo Sushi and Asian Restaurant. Again. Yay. The conference is over but we’re staying in town for a day of site seeing. More about that on Day Four. 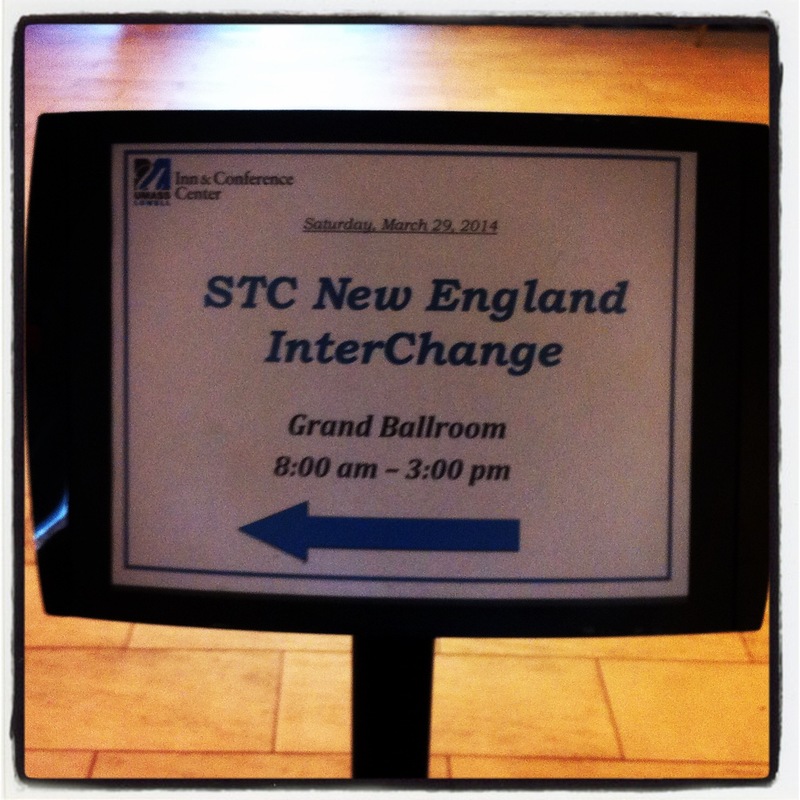 On March 29th and 30th, I attended InterChange 2014, STC New England’s annual conference at the UMass Lowell conference center in Lowell, Massachusetts. The conference is well planned and well attended. Local conferences have an advantage over the international Summit conference because they are shorter and cost less for the travel, room and board, and the shorter length keeps you from wandering around on the fifth day sleep deprived and overloaded. The smaller size allows you to recognize faces and develop real relationships with your fellow technical communicators. This post is about Day Two. You might also enjoy reading Day One. On March 29th, seven terrific speakers will give presentations. All of us will have breakfast together, then attend the keynote speech, then choose three of the six presentations on the program. It’s hard to choose and I’m wishing for a time machine. During breakfast, I meet Karen Smith and Patricia Gale from Autodesk and make a note to attend their presentation about agile documentation. Karen and Patty will be previewing their Summit presentation here for us at InterChangeNE. Since their presentation is at the exact same time as my Lightning Talk, I’m glad to see it today. 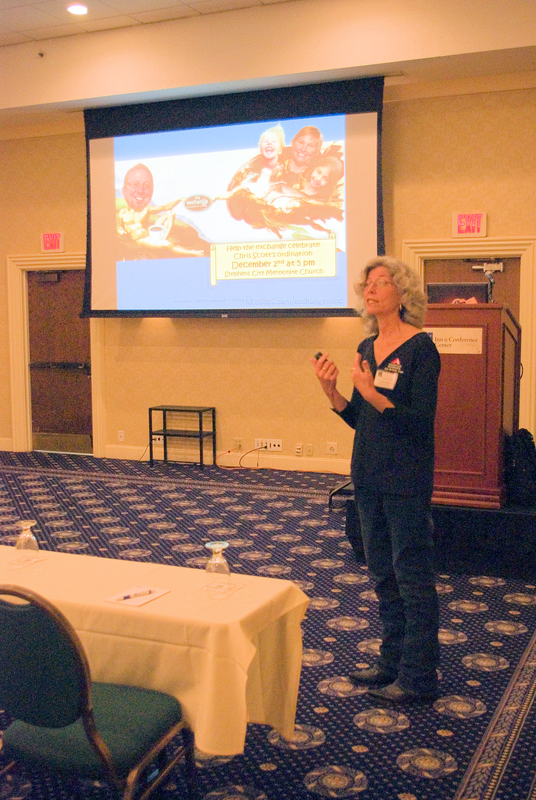 Cindy Currie-Clifford delivers the keynote speech to open the conference. She talks about the history of the InterChange conference. The New England chapter has a rich history, spanning decades, transitioning organizations, and partnering with industry and academia. I was both impressed and overwhelmed with the scope of Cindy’s talk. Mostly what I remember about Cindy’s talk is that it snows during the conference. It snows a lot. Cindy had photos of huge mountains of snow. 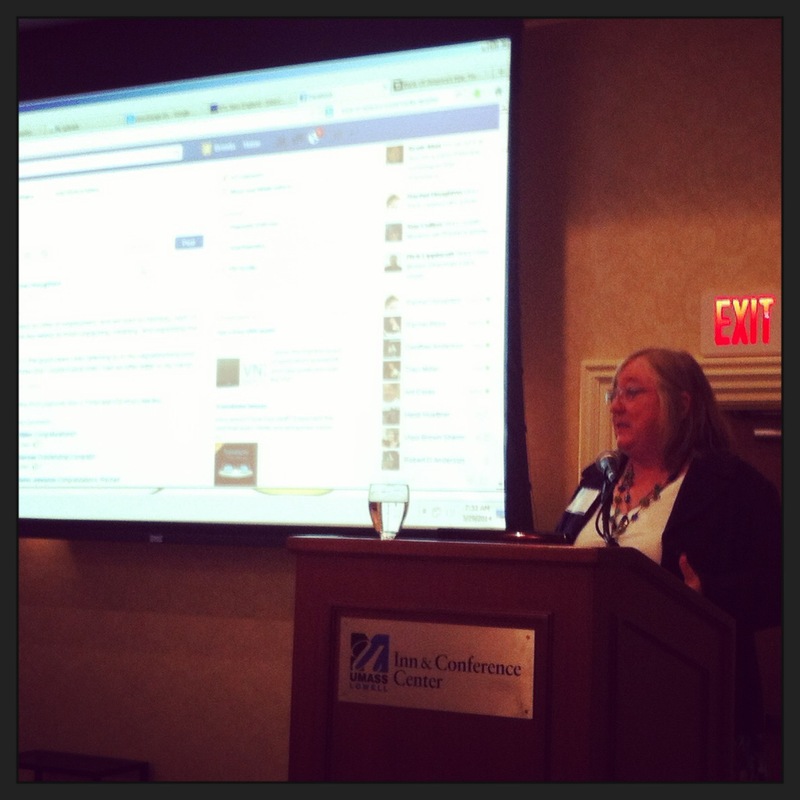 Brenda Huettner brings us a grab bag of social media savvy and gives us permission to google ourselves. Brenda is funny and engaging and taught me a thing or two about interacting with the web. In this photo, Brenda explains how our kids are blocking us in Facebook without us even knowing it. While Brenda was talking, some of us took photos of her and posted them to Facebook. Brenda opens up her Facebook newsfeed and sees herself on the screen. Awesome! Thank you Global Vision, Inc. for sponsoring our happy hour at the Old Court Restaurant and Pub. 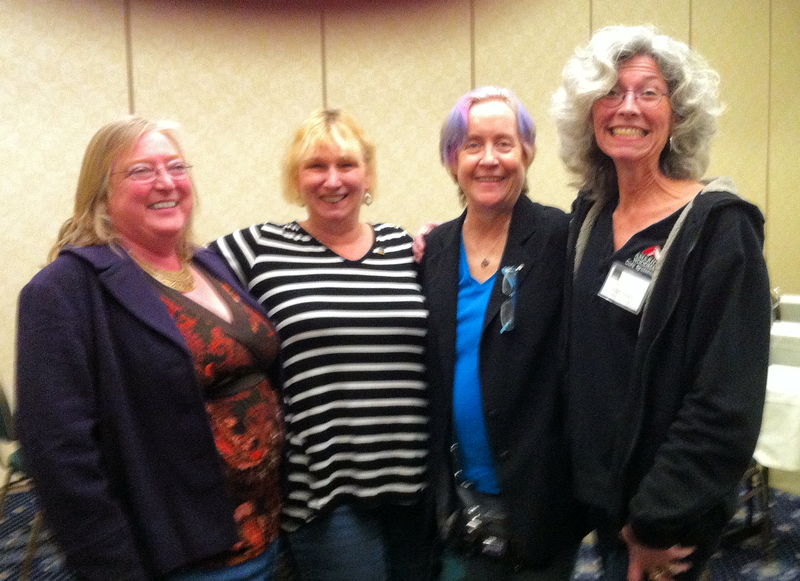 Here’s a photo of me, Cindy Currie and Anna Pratt (left to right) taken by conference chair Rick Lippincott. Rick is a talented and prolific photographer and took a bazillion awesome photos of the event. Check them out on his flickr photostream. Happy hour is a fun way to unwind after the presentations of the first day and the rain falling outside just makes it feel warmer and friendlier inside this local Irish pub. 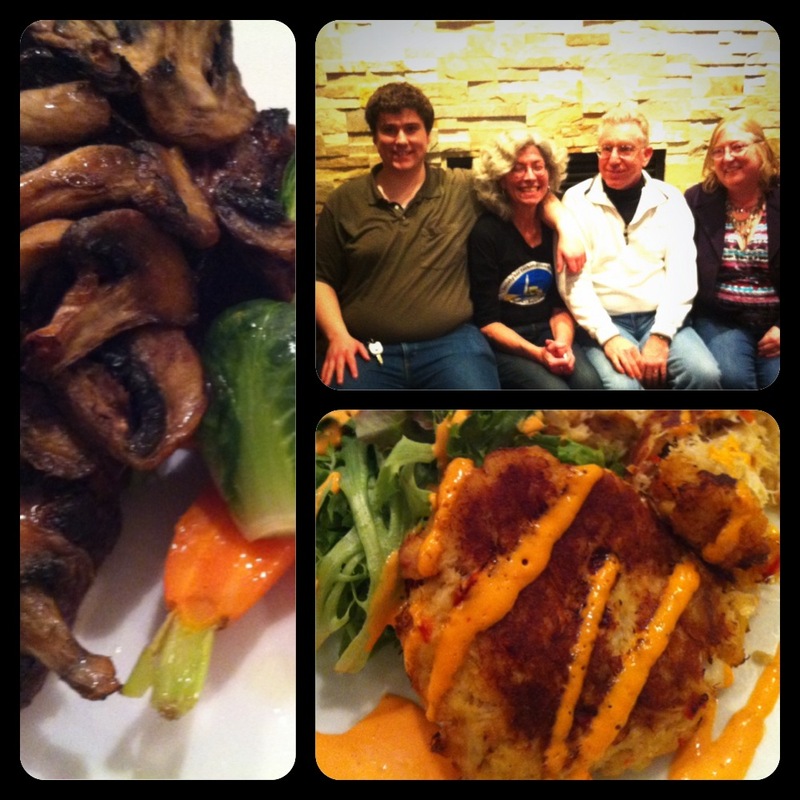 We had dinner at Etsogo Sushi and Asian Restaurant. We really like this place. It has a family atmosphere and Rick Lippincott knows the staff. The sushi was amazing with lots of choices for American tastes with cooked fish and shellfish, wrapped in layers of avocado and covered with sauce. Go there if you’re anywhere near Lowell and tell Irene “Hi y’all” from me. Now to go to bed so I can be well rested for Day Three. On March 29th and 30th, I attended InterChange 2014, STC New England’s annual conference at the UMass Lowell conference center in Lowell, Massachusetts. This was my first local chapter conference although I have attended many of the summit conferences held by the STC mothership. I was really impressed. The local conferences are typically smaller and shorter, eliminating the sleep deprivation and overwhelming size of the summit, while offering many opportunities to learn, share, and eat with other technical communicators. But I get ahead of myself. First, I have to get there. Howdy! Thanks for your email. I will be out of the office until Wednesday April 2nd, with some limited access to email. My cell is 540.303.0323. Don’t be shy about calling or texting if you need me. I also left a note on my keyboard for anyone dropping by on foot. What do you think of my self portrait? 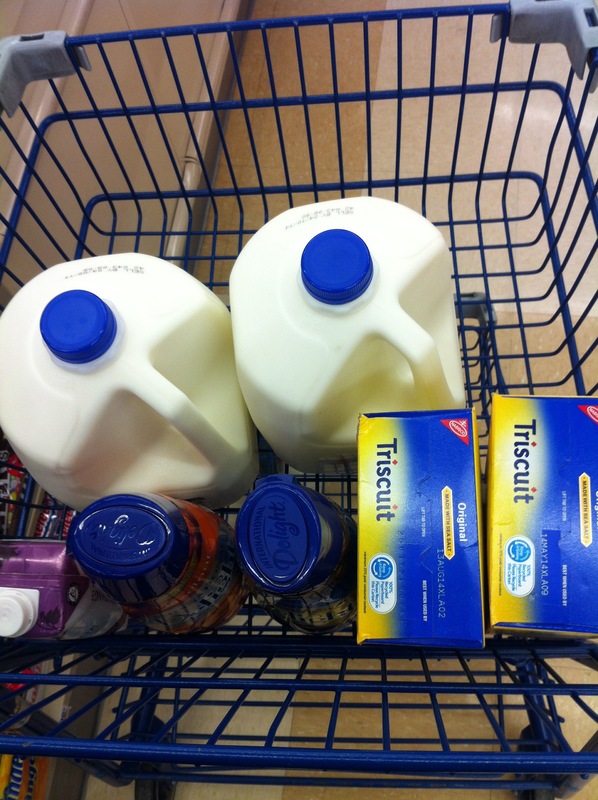 And I knew I’d be in the doghouse if I left the house empty of food, so I made a last minute run to Food Lion. I’d be gone for four whole days, during which time I’m pretty sure the grocery store must have been closed because I returned to a house that was once again empty of food. Okay, I know this is not the same as leaving frozen versions of home made gourmet meals in the fridge. So we’ve taken care of the office and we’ve taken care of the home place. We like to have a good book with us when we travel. This trip we take along a book about the future in which life is so bad and resources are so scarce, people have chosen to live out their lives inside a video game. 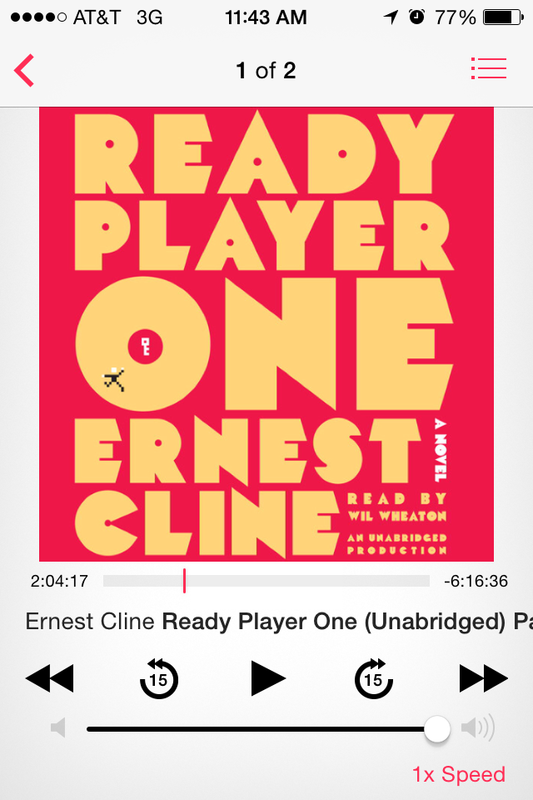 The book is nice and long, 17 hours total dedication to epilogue, so we have plenty of entertainment as we go. Can’t tell you how it ends because we aren’t finished yet. Perhaps another long road trip is in our future. And now, I’m saying “we” instead of “me” referring to the travelers. I forgot to tell you that my favorite son, Jim Dill, is along for the trip. We make great time up until we hit traffic on I 84 in Hartford Connecticut. Going the speed limit through Pennsylvania. 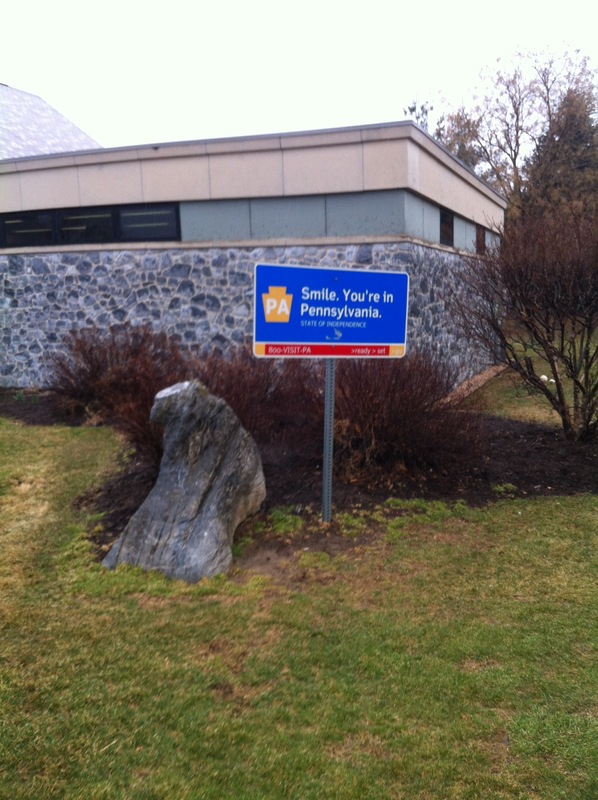 Stopping and almost every rest area. Somebody always has to “rest” on a long trip. We passed through a town called “Frackville” where you could buy coal at the local gas station but you could not buy gas there because the tanks were empty. We eventually found a station with gas left in the tank, checked in on Foursquare, and got back on the road. 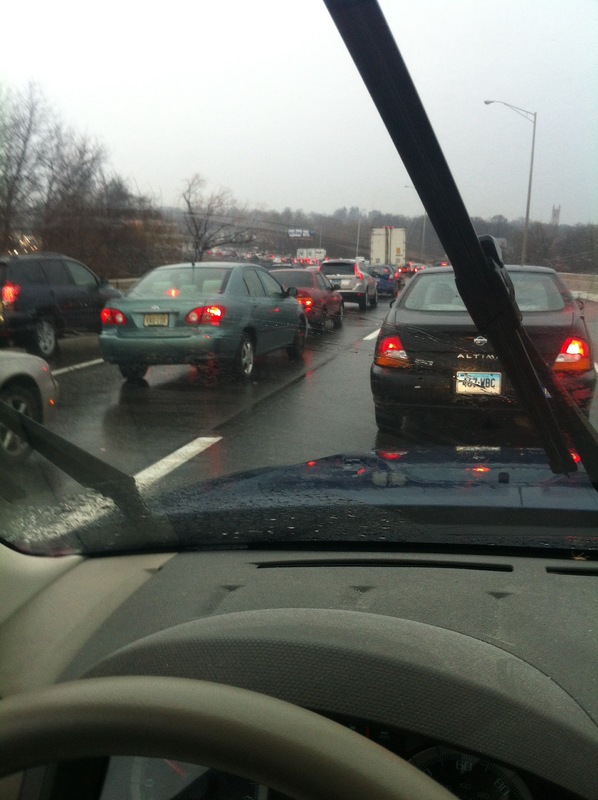 And then we hit a wall of traffic at Hartford. Jim decides this is a good time for a nap and when he wakes up he has to take a wicked pissa. We are downtown, stopped in traffic, and far from an exit. We talk about going by the side of the road but decide to tough it out. 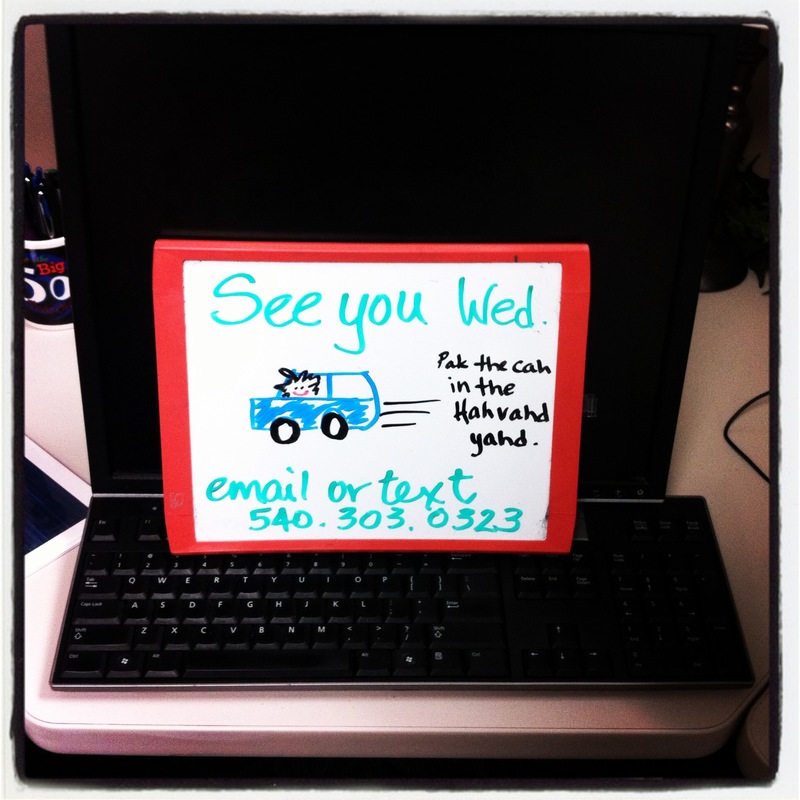 We make a note of the traffic and our location and make plans to stop way ahead of Hartford on the way home. Nobody peed in the car nor by the side of the road but somebody came close that day. Navigating in Boston in the dark was a little tricky and we ended up doing 6 leaves of a cloverleaf intersection so we could have a second chance of making the right ramp onto the Lowell Connector. Very confusing. The conference center is lovely. My friends greeted me with hugs and an invitation to join them at the bar. We’re not in the car now, after 12 hours of travel. We order a steak and the crab cakes. Our new best friend, bartender Amy, takes a photo of us relaxing by the fireplace. 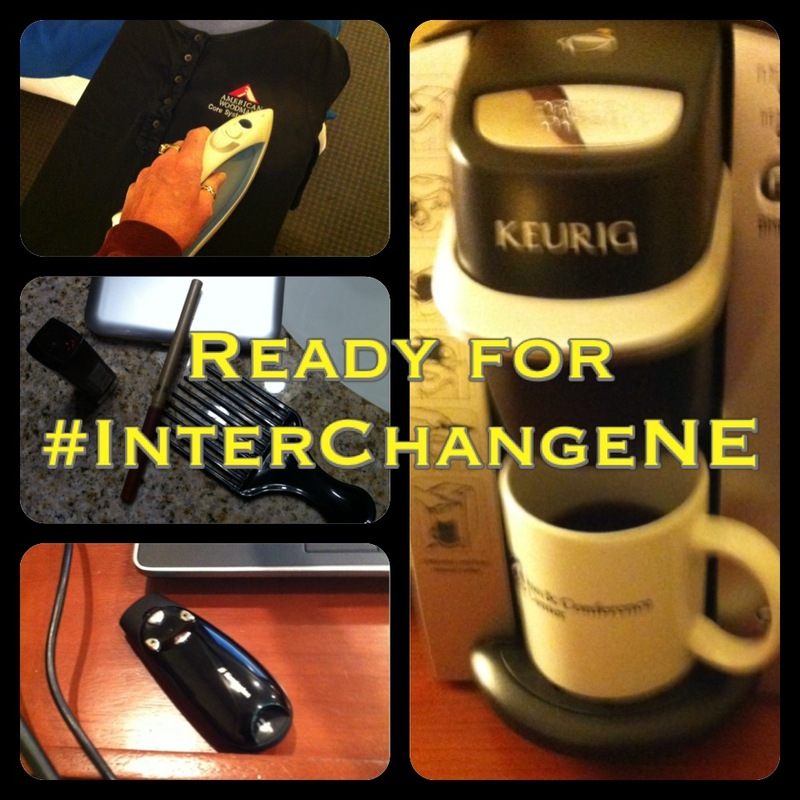 We instagram with the conference hashtag #InterChangeNE. We leave a big tip and retire early so we can have an awesome day two at the conference. I’ll write more about that tomorrow.